There has been ethnic tension in Myanmar’s Rakhine State in recent years. The crisis has triggered a mass exodus into neighbouring Bangladesh generating security threats to the South Asian country. ETHNIC TENSION has prevailed between the Rohingya minority and the dominant Rakhine Buddhist population for centuries. The Rohingya population has been oppressed and persecuted by the Myanmar military and Rakhine Buddhists for decades. This ethnic tension has recently given birth to a new armed organisation Arakan Rohingya Salvation Army (ARSA) that recently called for an all-out resistance to the Myanmar government. But the Myanmar army’s counter offensive triggered one of the largest refugee outflows into Bangladesh in decades. The resulting Rohingya refugee crisis in Bangladesh poses security threats and challenges on the full spectrum of the security landscape. The challenges range from human or non-traditional security encompassing transnational security, internal security, militancy and terrorism, border security etc. The Rohingya refugees are vulnerable to human trafficking, food insecurity and health insecurity. It has been reported that international human trafficking gangs are actively looking at this situation to exploit the vulnerability of the Rohingya. Many Rohingya families are arriving in Bangladesh without any male family members. Therefore, many young women and children will fall victim to the trafficking gangs and end up in international markets for prostitution and slave labour. There is gross food insecurity within the displaced Rohingya refugee population arriving in Bangladesh. This has resulted in malnutrition and allied problems of food insecurity within the refugee population. The undetermined number of people arriving in Bangladesh would contribute to price hikes in the local markets. The health security of the Rohingya refugees is also a cause for concern. Any contagious diseases that rely on the human host have the potential to become an epidemic as refugees are living in densely packed camps. Many of the arriving refugees are already carrying a number of diseases, including tuberculosis, skin diseases and HIV/AIDS etc. The severe lack of safe drinking water may contribute to diarrhoea and cholera that could spread to the local population. The examples from the Haiti and Yemen are instructive. The massive exodus of Rohingya refugees might alter the internal security scenario of Bangladesh. These are vulnerable people in dire need of a living and are likely to be involved in petty crimes for their survival. Criminal groups may also exploit the situation. Public sentiments and emotions are running high on the Rohingya issue in Bangladesh. The continuous atrocities on the Rohingya population in Rakhine State by the radical militant Buddhists have given rise to strong resentment of the local population in Bangladesh. This may trigger a backlash on the minority Buddhist population in Bangladesh. This could pose a major challenge to communal peace and harmony in the country. The geographical proximity of the Golden Triangle and the Golden Crescent makes Bangladesh an attractive route for drug smuggling. The international gangs will exploit Rohingya as couriers for the drugs and small arms smuggling. The easy availability of small arms and drugs can greatly jeopardise the security situation in Bangladesh, as more drug cartels and criminal gangs would mushroom near the border areas. Many militant and terrorist groups have called for jihad in response to the prolonged Rohingya crisis in Rakhine State. Transnational terror organisations are calling for recruitment for jihad in Myanmar as stories of thousands of Rohingya victims are broadcast on the Internet. A right-wing Islamist organisation from Indonesia, Front Pembela Islam (FPI), has opened registration for 1,200 mujahideen volunteers to join in the jihad in Myanmar in defence of the Rohingya. More established terror outfits such as Al Qaeda in Indian Subcontinent (AQIS) as well as Islamic State (IS) have expressed solidarity with the Rohingya. Chechen groups have shown their willingness to fight alongside the Rohingya. The possibility of prolonged ethnic conflict in Myanmar might create a hotbed of terror as foreign fighters set eyes on the region. The security dilemma comes at a time when IS, in responding to setbacks in Syria and Iraq, is planning on expanding operations beyond the Middle East. The prolonged refugee crisis in Myanmar is making the border of Bangladesh vulnerable and unstable. Bangladesh has experienced tension and near-conflict in the border area with Myanmar on both land and water. Given such a history, the possibility of a border conflict cannot be ruled out. There has been reports of violation of the airspace of Bangladesh by the Myanmar air force in the last few days. This is not conducive for the border security and stability. It is impossible to completely seal off the border due to the porous nature of the Bangladesh-Myanmar boundary. Thus the instability and violence in Rakhine State, especially activities of terror groups with linkages to the Rohingya will pose a threat to Bangladesh’s border security. The instability at the Bangladesh-Myanmar border may give rise to the emergence of non-state actors and this can complicate the internal security of the states. Due to the large influx of the Rohingya refugees, many fail to find shelter within the camps. As a result, many of them have spread out to the nearby hills. They have resorted to widespread deforestation, causing severe land degradation of the locality. Bangladesh is already vulnerable to a new threat from human-induced degradation of the environment that can have a long-term impact on its environmental security. The Rohingya situation is urgent and complex. The mass exodus of Rohingya is already putting enormous stress on the limited resources of Bangladesh. 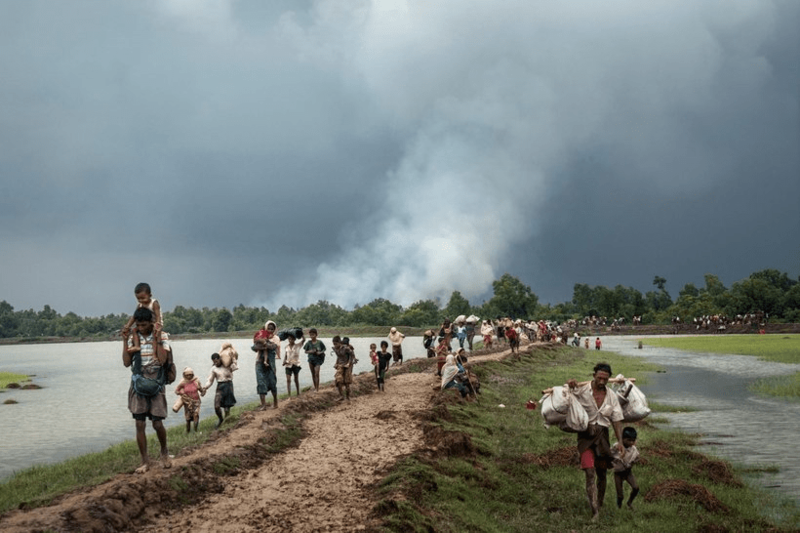 As more Rohingya arrive on a daily basis, there are a number of states and non-state actors that might try to exploit the security situation in this country. Bangladesh must find a comprehensive solution to the refugee crisis and must work out a cohesive security strategy to deal with all the potential threats. Otherwise, the security of the state will be in serious jeopardy.